We met in Washington, DC on this 14th day of April for our second gathering as Finance Ministers of developing economies systemically vulnerable to climate change chaired by Hon. 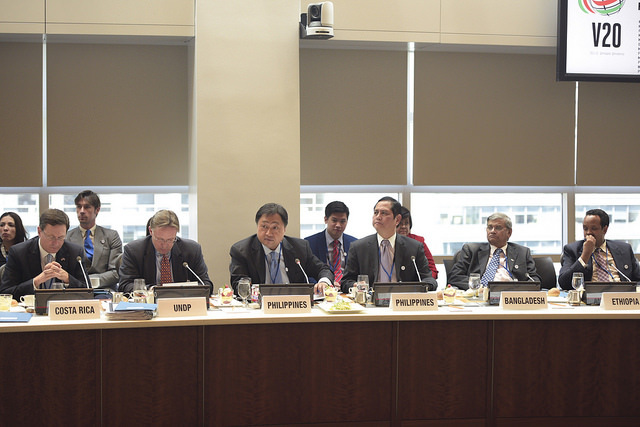 Cesar Purisima, Secretary of Finance of the Philippines with Bangladesh and Costa Rica as Troika Co-Chairs. We reviewed progress in responding to this defining challenge in our time for survival and for the economy, and we advanced our collective work. 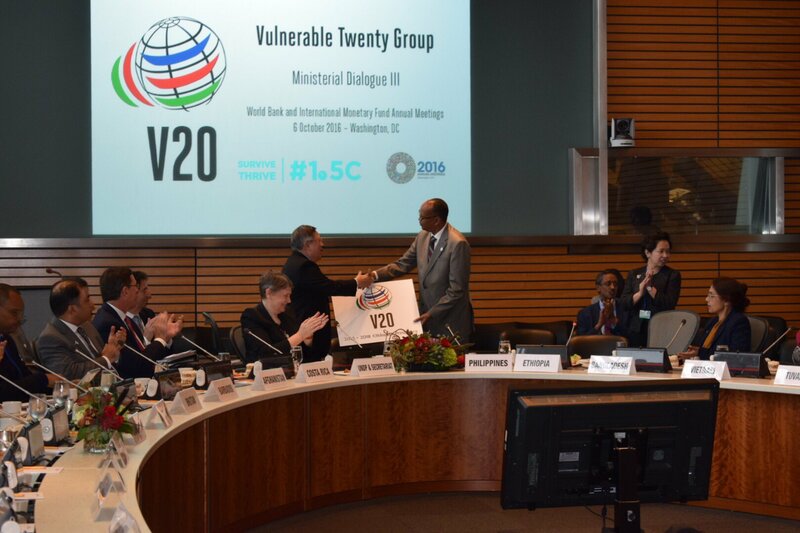 We recognized 23 new V20 members considerably strengthening our dedicated cooperation for enhanced economic and financial actions to address climate change while remaining true to the core needs of members most threatened by global warming. Our economies are home to one billion people whose fate hinges on an effective response. We called for bolder action by the world’s major economies, strengthened international partnership and reaffirmed our intentions to lead, despite our marginal contribution to global emissions, through actions at home to the limits of our capabilities. We take pride in our successful efforts advocating for the landmark new 1.5 degrees Celsius warming target agreed at Paris in December 2015. We now devote our energies to ensuring a financial system consistent with 1.5 degrees and the reinforcing of the resilience of vulnerable groups around the world. We expressed alarm at the shattering in 2015 of all temperature records and for surpassing a 1 degree Celsius rise in heat above the pre-industrial era norm. Vulnerable countries continue to suffer disproportionately from the fast accelerating rates of the planet’s warming. In past months we have struggled with widespread heavy rainfall, severe drought in Southern Africa, Latin America and the Caribbean, unprecedented cyclones and kingtides in the Pacific and heatwaves in Asia and Latin America. We face coastal flooding and erosion in our low elevation zones, increasingly adverse thermal conditions for much of our workforce, the compounding of regional security challenges and infringements to fundamental human rights. Even at 1.5 degrees, we will experience a considerable progression of impacts and dangers, underscoring the criticality and urgency of investing in increased resilience and adaptation. The impact of climate change, however, affects us all and carries macro-economic repercussions for growth already embedded as a negative weight on the global recovery. Determined to overcome these challenges, we fight on with renewed hope. Carbon emissions growth stalled for the second year in a row in tandem with global economic expansion. In addition, the past year saw around 90% of new energy production provided by renewables, according to the International Energy Agency, pointing to the clear compatibility of economic and climate change policies and the potential for further change. Strengthening responses to climate change will reinforce global economic recovery and help restore robust, sustained and balanced growth by containing explosive and costly climate change risks that worsen inequalities and harm people, communities and the world economy. Such actions are a humanitarian priority for protecting fundamental human rights. We presented our Intended Nationally Determined Contributions (INDCs) to reduce emissions under the new Paris Agreement as a first step to action. These INDCs are also the foundations of investment platforms for transformational economic action. Their realization calls for the delivery of additional and concessional international financing that safeguards debt sustainability, as we strive at ambition in communicated national adaptation and mitigation objectives that our Group aims to see realized, if not surpassed. We are advancing in parallel with the realization of our 2020 Action Plan to foster a significant increase in the level of resources from all sources to support ambition in our national climate actions. In the context of our Work Plan for implementing V20 priorities, we agreed on the commencement of the first phase of our Action Plan with an initial series of National-Regional Consultations to be hosted by Bangladesh and Philippines. We also established Focus Groups of our members to advance our work in the areas of Advocacy and Partnerships, Climate Accounting, and Risk Pooling. We welcomed the support of a wide range of partners and multilateral institutions behind our activities and look forward to building further on our collaborations moving forward with urgency in our response to climate change in the areas of disaster preparedness, financial protection, financial flow analysis, carbon pricing, public-private partnerships and risk pooling. In the context of our Action Plan, we agreed to enhance financial protection by addressing financial resilience against climate and disaster risks at national and regional levels. This includes a focus on strategies to improve the financial management of climate and disaster risks, and strengthen each country’s ability to recover from climate-related disaster shocks building from core principles of country ownership; sustainability; contingency planning; accountability; and private sector involvement. We recognize the vital role of the private sector in generating transformation change to the world economy and in our domestic markets. In doing so, we moved to create a platform for collaboration with the private sector focused on investment opportunities associated with responding to the challenges of climate change through innovations in the sectors of energy, transportation, infrastructure, buildings, agriculture, water supplies, well-planned migration, and other areas. The platform will also focus on publics-private partnership best practice, and on policies and initiatives to mobilize investment and other forms of private sector collaboration. We reiterate our strong support for innovative revenue generating fiscal and financial measures to raise finance, stimulate technological innovation and redirect investment toward climate resilient and low-emissions development. In this respect and with consideration to each country’s respective capabilities, we commit to support carbon pricing by working to establish pricing regimes within the next decade. As a first step towards the realization of that vision, we will begin work with international partners and platforms–including the Carbon Pricing Leadership Coalition and Market Readiness Partnership–to review options and best practices and engage in advocacy to promote similar steps in other markets towards the goal of a greatly increased share of global emissions subject to pricing. We request the Secretariat to prepare a working paper based on these interactions and agree to revisit collective implementation ideas at the next V20 Ministerial Dialogue. We also reaffirm our support for the urgency of carrying out innovative financial measures, including Financial Transaction Tax, as contributions to closing financial gaps between Paris Agreement objectives and the inadequacies of projected flows. We will continue our work in the area of improving financial accounting including valuation of the costs of climate change and the co-benefits of climate action in order to inform sound and refined economic policy-making domestically and at international level. In particular, we will promote methods and approaches to internalizing the externalities of climate change into finance since the factoring of these costs is essential to altering business-as-usual courses of action and to driving greater ambition. We appreciate and call for further analytical research into the nature of international climate change finance flows with respect to UNFCCC commitments and the independent commitment of developed countries to provide 0.7% GNI in Official Development Assistance. Our work in this domain will continue under the Focus Group on climate accounting. Extending insurance coverage, ensuring grass-roots access and expanding risk pooling represent tremendous opportunities for increasing resilience to the wide array of climate-related catastrophes that continue to set back the lives of our people. Having reviewed the V20-mandated study prepared by the Secretariat into options for the creation of a V20 Risk Pooling Mechanism, we note that half the population of V20 countries lack access to external pooling mechanisms of any kind. Recognizing the importance of risk pooling for lowering premiums, extending insurance coverage, increasing pay-out reliability and promoting risk reduction, we agreed to move forward with the initiative. Building on the initial study, the Focus Group for Risk Pooling is tasked with developing a complete proposal for the Mechanism within one year in further consultations with key stakeholders. We strongly welcome the adoption of the Paris Agreement on Climate Change and its enshrining of our key priority to limit warming to not more than 1.5 degrees Celsius, keeping temperatures well below 2 degrees. We also welcome the new global goal on adaptation for enhancing adaptive capacity, strengthening resilience and reducing vulnerability and the new significance the Agreement accords to climate justice, human rights and loss and damage. Early ratification/accession led by the vulnerable countries–Fiji, Palau and Marshall Islands–is an immediate priority for all nations, and essential to give effect to the framework. Efforts should immediately be undertaken to implement and increase the ambition of national commitments to achieve compliance with a 1.5 degrees goal, recognizing that higher levels of warming threatens the very survival of a number of our low-lying island members. It is therefore equally imperative that all countries’ long-term low greenhouse gas emission development strategies for communication in 2020 demonstrate consistency with actions to achieve the 1.5 degrees limit. The international community should take advantage of the 2018 facilitative dialogue to take stock of collective efforts to inform these actions including on the basis of the forthcoming UN Framework Convention (UNFCCC) -mandated Intergovernmental Panel on Climate Change (IPCC) Special Report on 1.5 degrees that was agreed to this week in Nairobi during the IPCC’s 43rd session. International public finance commitments including financial support will be vital to enabling an ambitious global response. Capacity constraints facing developing countries are particularly severe for those most vulnerable to climate change. Swifter progress towards the achievement of the joint US$100 billion developed country commitment for support to developing countries, including as a priority via the Green Climate Fund, will build confidence in global efforts and contribute to raising ambition. 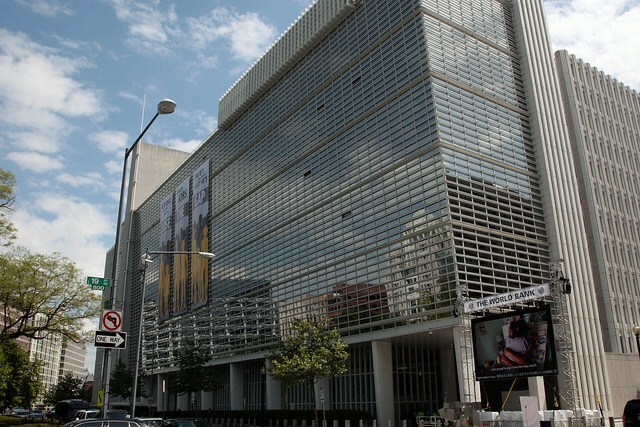 Global resource mobilization must go far beyond the US$100 billion. We further appreciate the new UNFCCC post-2025 joint finance commitment from a floor of US$100 billion by developed countries in support of meaningful developing country climate action. Important Paris Agreement provisions include the consistency of financial flows with low-emissions and climate-resilient development and the need for grant-based finance for adaptation, which is vital for actions among the world’s poorest groups and informal or non-market sectors. We also strongly welcome UNFCCC decisions on efficient access to financial resources through simplified approval procedures and enhanced readiness support for developing countries which are urgent priorities right now. We appreciate the Capacity-building Initiative for Transparency to support developing countries to meet the enhanced transparency requirements and frameworks including on finance. We welcome UNFCCC decisions encouraging all parties to voluntarily contribute to climate finance and recognize those V20 members that have already funded the Convention’s Financial Mechanism while encouraging all countries to consider similar actions. We continue our call for the internationally agreed balance of climate change finance to be achieved as an even 50:50 allocation between adaptation and mitigation by 2020 at the latest. Lives, health, fragile ecosystems, and progress towards the 2030 Sustainable Development Goals depend on greater support for adaptation given the socio-economic dimensions of climate change vulnerability with the poorest groups, women and children among the hardest hit. We expect the instruments to the UNFCCC Financial Mechanism to demonstrate progress towards early achievement of the balance and will focus our collective vigilance in that respect. We also call for the integration and continuation of the Adaptation Fund under the Financial Mechanism of the Paris Agreement. We call for additional support for our countries for the reinforcement of critical enabling climate finance mobilization capabilities. We express alignment with the G7 on the long-term objective of applying effective policies and actions throughout the global economy in the response to climate change, including carbon market-based and regulatory instruments. We extend appreciation to the G7 for its pledge to intensify support for vulnerable countries own efforts to manage climate change related disaster risk and build resilience. We welcomed the Financial Stability Board’s task force on climate-related financial disclosures and the establishment of a new G20 Green Finance Study Group to identify institutional and market barriers to green finance and develop options on how to enhance the ability of the financial system to mobilize private capital for green investment including in collaboration with external initiatives. We look forward to collaborate closely on these initiatives and call on the G7 and G20 to recognize the need for efforts to achieve the new 1.5 degrees limit and global adaptation goal. We urge G7/G20 steps to scale up climate action consistent with these objectives in solidarity with vulnerable groups inclusive of moves to implement and raise the ambition of previously communicated commitments by 2020 at the latest. We also expect the low greenhouse gas emission strategies of the major economies to demonstrate clear contributions to capping warming at 1.5 degrees. We urge further enhancement of the climate change focus of Multi-Lateral Development Banks and International Financial Institutions (IFIs), in the context of country-led/country-driven development and national partnerships, as aligned with ambitious new Paris Agreement objectives. We call for coordinated actions especially in the areas of infrastructure, energy and forestry, for the integration of climate change considerations in macroeconomic projections and Article IV IMF consultations. We request IFIs for innovative financing structures and solutions that respect our requirements for debt sustainability and for support on project due diligence and pipeline development. Such efforts would help leverage the full extent of investment opportunities embodied by our national commitments under the Paris Agreement and unlock further ambition as contributions towards achieving the 1.5 degrees limit and global adaptation goal. We welcome the World Bank Climate Change Action Plan, which we expect will make a significant contribution in this respect. In highlighting our need for mechanisms to pool risk and recalling our forthcoming work on carbon pricing, we also called for dedicated support to expand risk pooling and for readiness assistance on mechanisms for pricing emissions. We agreed to reconvene at Washington, DC in October 2016 for the third V20 Ministerial Dialogue and directed the Working Group to continue its activities in advancing the priorities of the Group. Following the 2nd V20 Working Group Meeting held last week, V20 delegates will convene in Washington DC for the 2nd V20 Preparatory Deputies/Senior Officials Meeting and the 2nd V20 Ministerial Dialogue on 13th and 14 April 2016 respectively. The meetings will affirm the V20’s commitment to the Paris Agreement, calling for a path towards the 1.5 degrees Celsius limit and greater financial protection for climate change impacts. The Ministerial meeting of the V20 is considering a Work Plan and extending commitments to pioneer and deploy financial and fiscal solutions to climate change. The V20 Risk Pooling mechanism will be a focus of discussion, along with progress on the 2020 Action Plan to mobilise unprecedented investment from all sources beginning with national finance dialogues and building partnerships with private sector partners. A V20 Communiqué will be issued at the conclusion of the event. 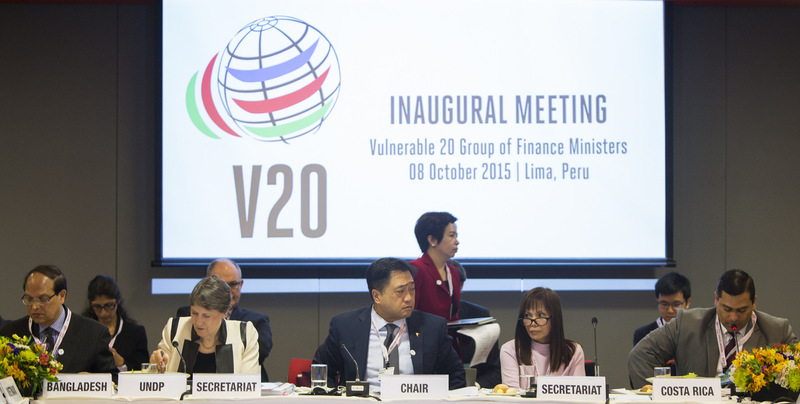 The V20 2nd Ministerial Dialogue will also see confirmation of new CVF member countries as V20 members. 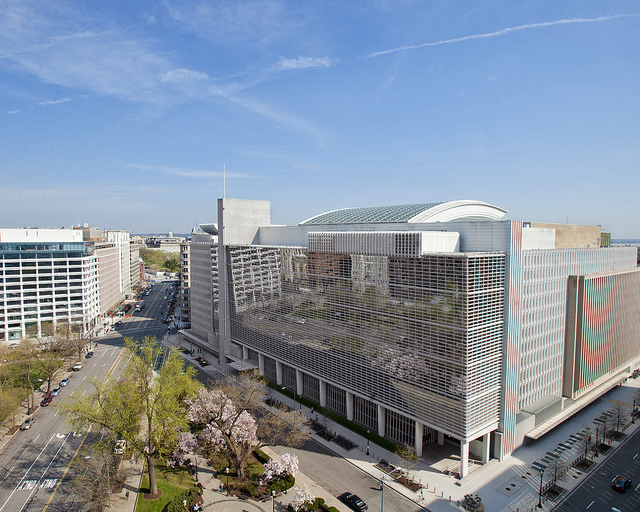 Participation in the 2nd Preparatory Deputies/Senior Officials Meeting and the 2ndMinisterial Dialogue is by invitation only and subject to registration for the World Bank and IMF Spring Meetings. Accredited media will be invited to attend a segment of the 2ndMinisterial Dialogue meeting. Admission to the V20 with Business reception is by invitation only.